I regularly receive emails and messages that claim to prove statements like 2 is equal to 1, 0 divided by 0 is 1 etc. Such proofs almost always contain an indeterminate mathematical step (an operation where the the result is ambiguous) leading to paradoxical/fallacious conclusions. Another common error is to treat infinity as a number. While infinity is a useful concept for indicating a limiting situation of increasingly larger numbers, it must not be treated as a number for mathematical operations. Mathematics deals with numbers; each number has a well defined value or magnitude. Manipulation of numbers is vital for our society to function efficiently - such manipulations follow well defined rules of addition and subtraction. Results of such operations are unique and should have no ambiguity. If there is ambiguity - the result is indeterminate, and for this reason they are unacceptable. a. If we think of infinity as a number that is larger than all finite numbers, then one can always think of a real number that is larger than that. then it implies that 1 = 2 = 0, and also that infinity is a number that is larger than itself. Similarly, if we write 1/∞ = 0 and also 2/∞ = 0 then it seems that 1 = 2 which is absurd. c. Greater-than, less-than, equal-to relations do not apply in the same way to infinity as they do to finite numbers. 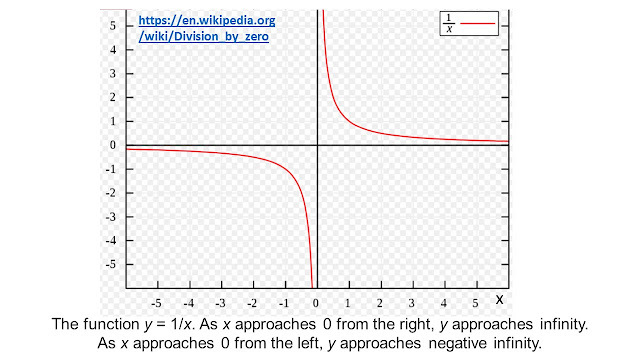 d. Infinity is a useful concept to indicate the limits to which the value of an expression approaches - for example, if x decreases from positive values towards zero then the value of 1/x increases, reaching the expression 1/0 at x = 0. While 1/0 in indeterminate, the limiting value of 1/x as x gets ever close to zero is exactly definable. 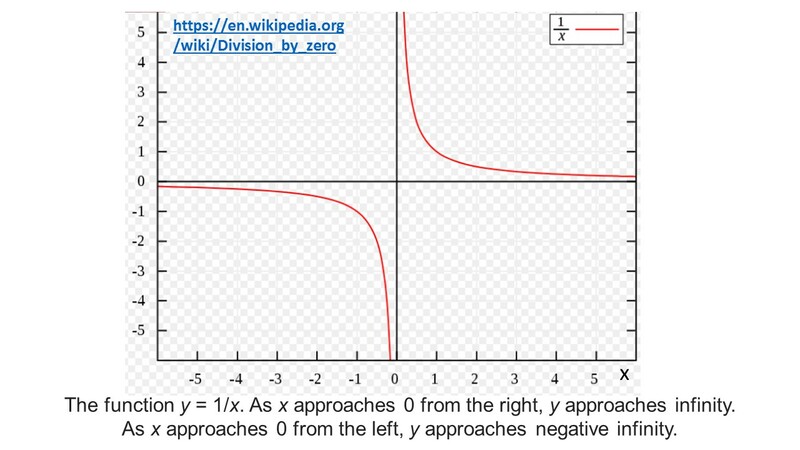 The above equation simply suggests that the limit, when x approaches zero, tends to infinity (an extremely large number) - it does not say that the value ever reaches infinity, rather that 1/x is increasing towards an extremely large positive value. and the equation simply says that as x approaches zero, 1/x tends towards an extremely large negative value. Since, we can not treat infinity as a number, any mathematical operations involving infinities must be treated as 'not allowed'. There might be special situations where one could consider infinity as a number and do maths with it, but we have to be very careful and watch out for paradoxical situations arising. Hilbert's Infinite Hotel Paradox, Thomson's Lamp Paradox, 1 = 0.9999... are some well known examples. Expressions (not a complete list) like 0 x ∞, ∞ + ∞, ∞ - ∞, p^∞, ∞^0 are indeterminate. Even though the first method has an infinite number of terms, in the second and third methods, we have one extra term. They are different series. The problem with this type of proof is that the number of recurring nines in eq.1 is one more than in eq.2. In eq.2, '0.999999...' is a different number from that in eq.1 and that creates the fallacious result. 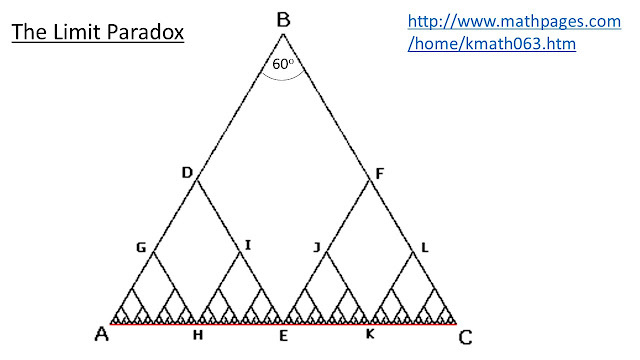 Division by zero: In mathematics, division is opposite to multiplication. If a divided by b is equal to c, then c multiplied by b must be equal to a. This rule does not work when we divide by zero. For example, let p = q/0; but p x 0 = 0 for all values of p (I shall deal with the case of 0/0 later). There is no number p that, when multiplied by zero gives any other number except zero, therefore, it is fallacious to say that q/0 = p. Dividing by x gives a very large number in the limiting case when x→0 but the limit when x = 0 is undefined. Four steps - 24 divided by 6 is 4. 24 - 0 = 24 ... for ever. The normal rules of division do not work when we divide by zero. Zero divided by zero: From our discussion above, 0/0 is not defined. zero divided by any number is zero - so 0/0 must be 0. Any number divided by itself is equal to one - so 0/0 must be 1. One can not have ambiguity in mathematical manipulations and the only conclusion we can draw is that zero divided by zero is undefined/indeterminate. Essentially, 0 x ∞ has no meaning in terms of mathematical operations. What is the value of 0^0 ? We know that any number raised to the power 0 is equal to one. these are valid mathematical operations. However, in the limit, when x goes to 0, both expressions reduce to zero to the power zero - the first one is equal to 1 while the second one is equal to 0. This is inconsistent with being an unambiguous result and for that reason unacceptable. Zero to the power zero is indeterminate. D, F and E are midpoints of sides AB, BC and CA respectively. Therefore, triangle ADE and EFC will also be equilateral but sides of length a/2. We can continue to half the sides, and as shown above, the sum of the sloping sides will be equal to 2 times the base AC. If we continue the process an infinite number of times then the sloping sides and the base coincide but according to our analysis the sum of all the sloping sides is twice the length of the base. This is a paradoxical result. Again, the resolution is found in our concept of infinity. The sloping sides are that way as long they are not horizontal - the height of the triangle is not zero. then the angle of the tiny equilateral triangles formed remains at 60 degrees. It collapses to zero as the sloping side coincides the horizontal base and in this limiting case - we do not have equilateral triangles any more - it is a different situation entirely. Final Word: This publication was meant to discuss some indeterminate mathematical operations in a language accessible to non-specialists. I have done away with formal statements as much as possible (I have not even used words like sets, axioms etc.) and for that reason, this blog piece may not be appreciated by the purist - but this is community education site. The main conclusions are: (a) Be very very careful when handling infinities -they are not numbers in the usual sense of the word; (b) While zero could be called a number, its position at the junction of positive and negative number lines makes it quite tricky to handle - again be very careful when doing mathematical operations with a zero.